Well, plaid, actually. I’ve been hooking on my New Years Underfoot rug and I’m more than halfway finished. This rug is 99.5% background. Do you like doing backgrounds? I don’t mind it, although I usually have “things” in the background, which make it more interesting. I’m using a muted plaid here and cutting it in a wide #8.5 cut. I love this cut for showing off the colors in the wool. In this plaid, the strips are a muted yellow, blue, tan or orange, which add lots of interest and movement. My usual background technique is to outline random odd shapes and then fill them in. The shapes look best if they’re not too small and fussy. There is also a sense of accomplishment as each shape is filled in. Small goals, I know, but I’ll take what I can get. I did manage to dye several shades of blue-green wool for snow and a nice piece of flesh-colored wool using Lucy Richards’ Wooly Mason Jar dye system. Her system is all thought out for me, which is a huge help. Thanks, Lucy! The snow wool is for my Snow Angel mat and the flesh colored wool is for a super secret project. 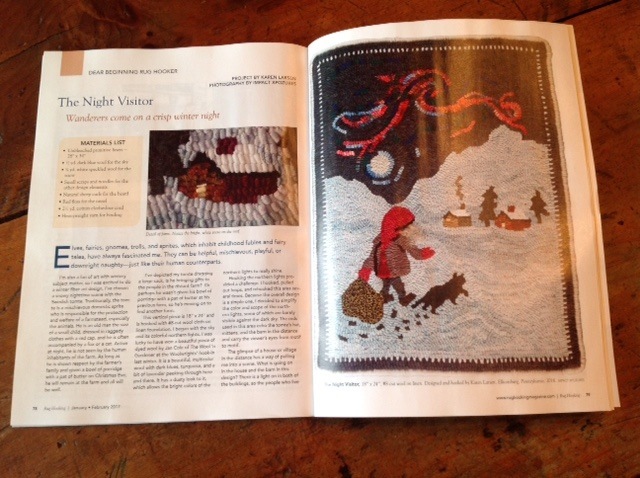 Speaking of snow, I have an article in the current Jan/Feb 2017 issue of Rug Hooking Magazine about the color of snow at night and the Purkinje effect. If you don’t get the magazine (I recommend it highly! ), you can go to Rug Hooking Magazine’s website and find my article there. It’s titled, The Night Visitor. Yes, the Muse has arrived and has goosed me into action. I have several rugs to hook that have deadlines, so I’d better get busy! There’s a lot of beauty out there and in hooking a useful rug for those snowy shoes and boots by the back door. The background wool before and after hooking. The Night Visitor pattern is now available on the Shop page of my website. Another year has ended and I’m hoping for the best for the New Year. Do you make New Year’s resolutions? I usually do, but I think this year I’ll just focus on rug hooking and try to avoid current events. I’ll call this my Year of the Ostrich. I had planned on dyeing some snow wool for my Snow Angel pattern last week, but that didn’t happen. I had a friend here for the Christmas holiday and we were out and about a lot and didn’t sit still long enough to work on artistic projects except for a bit of sock knitting in the evenings. We did visit the Family Heirloom Weavers in Red Lion, PA. I have bought numerous beautifully made woven coverlets, blankets, table runners, and pillows from them. Their products are the real deal and made with historical accuracy of the patterns. The quality of their goods is far and above that of foreign-made knock-offs. They also have ventured into a more contemporary look to expand their customer base. After my friend left for home, I decided I need a skinny rug to go by the back door for boots and shoes that are not worn inside the house. I consider this a “utility” rug, since it’s for a purpose and not just for pretty. This rug is 12” x 45” and features footprints of chickens and dogs. I could have added the footprints of other Crow's Foot Farm critters like deer, groundhogs, skunks, foxes and coyotes, but I wanted to keep it simple. Another utility project will be knitting several pairs of heavy socks for people to put on when they leave their shoes or boots by the back door. I like guests to be cozy and comfortable here. As we say goodbye to 2016, I want to thank you all for reading and commenting on my weekly blog, for joining in my book giveaways, and for your pattern orders this past year. I wish you and yours all the very best in 2017. There’s a lot of beauty out there and in the promise of a New Year ahead. The first few footprints have been hooked in the hall runner.